In structural geology, a syncline is a fold with younger layers closer to the center of the structure. A synclinorium (plural synclinoriums or synclinoria) is a large syncline with superimposed smaller folds. Synclines are typically a downward fold (synform), termed a synformal syncline (i.e. 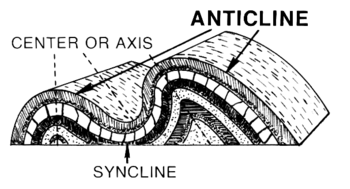 a trough), but synclines that point upwards can be found when strata have been overturned and folded (an antiformal syncline). On a geologic map, synclines are recognized as a sequence of rock layers, with the youngest at the fold's center or hinge and with a reverse sequence of the same rock layers on the opposite side of the hinge. If the fold pattern is circular or elongate, the structure is a basin. Folds typically form during crustal deformation as the result of compression that accompanies orogenic mountain building. Syncline in the lower parking lot of Calico Ghost Town; the ductile folding is at the base and the brittle is above.